Frame Relay is one of the most popular WAN services out there in the real world despite it also being one of the oldest WAN technologies available and there is a very good reason for the continuing popularity of Frame-relay that is down one simple factor which is cost. Anyone building a WAN will generally consider Frame-relay as a viable connectivity option due to the cost alone, WAN's are not cheap by any margin so having Frame-Relay available to connect your different sites together is nice to know. FR (Frame-Relay) was born out of an older technology called X.25 which even though is older than FR is still in use in certain parts of the world. X.25 was a very robust protocol that had solid error recovery features which were very useful when the network infrastructure was prone to causing transmission errors on the sent data, one major drawback to X.25 as that due to the constant error recovery features it was very slow. As time progressed technology improved, at the same there was a requirement for faster transmission speeds from the WAN providers, this lead to the creation of Frame-Relay which on closer inspection operates in much the same way as X.25 but with out the extensive error detection and correction carried out by X.25. By default, Frame Relay is classified as a non-broadcast multi-access (NBMA) network, meaning it doesn't send any broadcasts like RIP updates across the network. No worries-I'm not going leave you hanging. We'll get into this more soon. 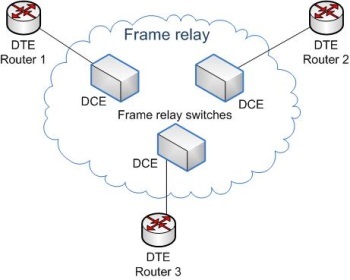 Frame relay is a fairly simple protocol to get to grips with, and is taught in the Cisco CCNA course, having said that setting up this technology and configuring it on the router is considerably more complex than setting up say PPP or HDLC which require one command on the serial interface and you're done. In this technology we need to know the way in which the protocol it's self functions, we need to learn a new addressing scheme and new way in which the Layer 2 addresses are resolved even though frame-relay does not allow address resolution traffic to pass from one site to another like it would in an Ethernet environment. There are also many terms that you need to learn in the CCNA regarding this WAN technology, you have to know the difference between a PVC and SVC, and the function of the three types of Local Management frames (LMI's). Joe Spoto is a senior lecturer at Commsupport networks in the United Kingdom. Joe teaches Cisco CCNA, CCNP, CCVP courses when he is not out on the road fixing and building networks, if you want to find out more about what we do at Commsupport please visit us at Commsupport run free one day training sessions and free on-line webinars.